Hey there my internet family! I'm so excited to share with you the newest pattern to my collection. I know I say "this is my favourite" for just about all my crop top patterns but this one will definitely remain close to my heart for a long time to come. I love the cluster stitching in the centre of the top and the beautiful picot edging throughout. The yarn I used for this halter top was King Cole Bamboo Cotton DK. I can't stress enough how much I love this yarn. It's texture is so soft and the texture and the look of the stitches are simply stunning. So if you can get your hands on this yarn I totally recommend it. This pattern is in American crochet terms. The following pattern gives instructions for an xs-s size. However, if you want to make it bigger make a chain long enough to reach from one side of the rib cage under your breasts to the other side of the rib cage. Make sure that number is divisible by 2, then add an extra 2 stitches to that number. Double crochet into the 3rd stitch from the hook. Double crochet to the end. Turn. Now you will place a marker into the 41st stitch. You will now have 40 stitches each side of the marker. Chain 2 (counts as the 1st double crochet) and double crochet 2 together (Dc2tog) and then double crochet until the 3rd stitch from the marker. You will have two stitches between the marker and the last worked double crochet. Skip the next 2 stitches and place 3 double crochets into the stitch with the marker. Then chain 3 and place another 3 double crochets into the same stitch. Skip the next 2 stitches and double crochet into the next. Double crochet across the remainder of the row until 3 stitches remain. Double crochet together (Dc2tog) over the next 2 stitches. Then double crochet into the last stitch (on top of the chain 2). Turn. Chain 2 (counts as the 1st double crochet). Dc2tog. Then double crochet until you reach the stitch before the 1st cluster of 3 double crochets. Skip these 3 stitches and make (3dc, ch 3, 3dc) into the chain 3 space. Then skip the 2nd set of 3dc cluster and double crochet into the following stitch. Continue across the remainder of the row until you have 3 stitches remaining. Dc2tog. Then double crochet into the last stitch (on top of the chain 2. Turn. Repeat the last row until you have a total of 30 rows from the very beginning. Chain 1 and single crochet until you reach the stitch before the cluster. Make 3 single crochets into the chain 3 space. Skip the remainder of the cluster (the next 3 dc's) and single crochet into the following stitch. Single crochet across the remainder of the neck part. Chain 1 and single crochet down the side of the top, across the bottom, up the other side and slip stitch into the chain 1 you began with on the neck part of the top. Chain 1, single crochet into the next stitch, **chain 3, slip stitch into the 1st chain you made of that chain 3 (picot stitch created) skip the next single crochet, then single crochet into the following stitch. ** Repeat from ** all the way around the top. Slip stitch into the chain 1 you made at the beginning of the row. With yarn still attached make a chain long enough for a neck strap. I did about 150 chains. Cut yarn and fasten off. Attach yarn on the other side and repeat the long chain for the second neck strap. Then attach yarn on the bottom corner of the top and make a chain of 200-250. Fasten off and repeat on the other side. Weave in any ends you may have and you are done. I hope you enjoy making this top. I would love to see all your creations on Instagram. Just search for @hey_carriex. Ok, my knit beanie obsession continues! I just can't stop. Two patterns in three days! Wow I'm on a roll. So, the other day I was in my local Aldi and discovered a bunch of super chunky yarn in an array of color so naturally I couldn't resist. To be honest I think I bought the lot! The second I came home I wanted to knit and design another beanie hat and so I got thinking. ANIMAL PRINT! Why not create a super chunky beanie with super cool animal print, and here it is. 7 mm circular needle (16") or double pointed needles. Start of with your contrasting color (CC). In this case I've used dark blue. Begin with knit 1, purl 1 ribbing. 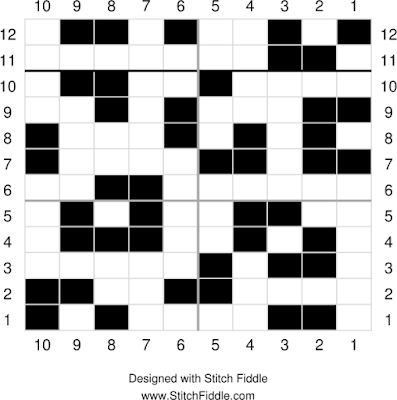 Continue in this pattern until you have 9 rows completed. From now on we will be working the main part of the hat (the animal print. You can work off the chart below or simply read the instructions. If reading off the chart remember to begin at the very bottom right hand corner and making your way across towards the left. Every round begins on the right. Round 1: Attach your main color (MC) which in this case is light grey. (K1MC, K2CC, K4MC, K1CC, K1MC, K1CC) 5 times to end of round. Round 2: (K4MC, K2CC, K2MC, K2CC) 5 times to end of round. Round 3: (K1MC, K2CC, K1MC, K1CC, K5MC) 5 times to end of round. Round 4: (K1MC, K1CC, K1MC, K1CC, K2MC, K3CC, K1MC) 5 times to end of round. Round 5: (K2MC, K2CC, K2MC, K1CC, K1MC, K1CC, K1MC) 5 times to end of round. Round 6: (K6MC, K2CC, K2MC) 5 times to end of the round. Round 7: (K2CC, K1MC, K2CC, K4MC, K1CC) 5 times to end of round. Round 8: (K1MC, K1CC, K1MC, K1CC, K1MC, K1CC, K3MC, K1CC) 5 times to end of round. Round 9: (K2CC, K3MC, K1CC, K1MC, K1CC, K2MC) 5 times to end of the round. Round 10: (K4MC, K1CC, K2MC, K2CC, K1MC) 5 times to end of the round. Round 11: (K1MC, K2CC, K7MC) 5 times to end of the round. Round 12: (K1CC, K1MC, K1CC, K2MC, K1CC, K1MC, K2CC, K1MC) 5 times to end of round. Continue now with your main color. For the next 3 rounds you will be decreasing for the crown. K2tog to the end of the round (x3). Cut your yarn leaving a long tail. Thread it onto a yarn needle and weave through your remaining stitches. Secure the yarn with a stitch or two in the inside of the hat. Now all you have to do is add a pom pom and you are ready to go. I've recently taken up knitting again and I'm completely obsessed! Long before crochet came into my life I remember being about nine years old learning knitting in primary school. Back then the nuns ruled most schools while "regular" teachers were few and far between. I remember I absolutely hated knitting! Basics such as casting on was an unbearable task altogether. Nothing about the craft stuck to me whatsoever. I suppose having a stiff lipped ogre of a nun luring over your shoulder shouting, "it's like pulling teeth trying to teach you". Oh the memories! Fast forward a few years and while in the comfort of my own home I self taught within a day. But somehow over the years I discovered crochet and dropped knitting. I had forgotten how much I love knitting. I love the textures of all the different stitches, something crocheting just doesn't live up to. Anyways, I'm rambling on quite a bit now. Fall has definitely arrived here in Ireland and I really couldn't be happier. It is after all BEANIE SEASON!! Here's how I made this simple knit beanie. 7 mm circular needles (16") or double pointed needles. You will be starting with the band of your beanie so begin with your knit 1, purl 1 ribbing. Continue until you have completed 9 rows. Row 10 - 34 Continue in stocking stitch. If you want a slouchier hat simply add more rounds. Row 35- 37 Knit 2 together all the way around to the end of the round. Cut your yarn leaving a long tail. Thread your yarn on to a tapestry/yarn needle and weave through the remaining stitches. Pull tight to close the top of the hat and secure the end of the tail in the inside of the hat. Weave in all ends. Add a pom pom if desired. Your hat is now complete. In the photo above I made the beanie in 3/4 burgundy and 1/4 cream but of course any color way will be perfect.